Job creation in the U.S. labor market cooled from a breakneck pace. The U.S. economy added a sharply lower-than-expected 20,000 non-farm payrolls in February, the Bureau of Labor Statistics reported Friday. Consensus expectations called for 180,000 positions to be added for the month, according to Bloomberg data. February’s headline reading for new payrolls was the weakest in 17 months. Non-farm payrolls in January, however, were upwardly revised to 311,000, from 304,000 previously. Coupled with December’s latest revision, employment gains in December and January were 12,000 more than previously reported. The unemployment rate fell to 3.8%, from 4% in January. Consensus economists expected this to have ticked down to 3.9%. The labor force participation rate remained unchanged in February at 63.2%. The broader U-6 measure of unemployment, which also includes those underemployed as well as those no longer looking for a job, fell to 7.3% from 8.1%, reaching its lowest point since 2000. Average hourly earnings in February increased to 0.4% month-over-month and 3.4% year-over-year, higher than the 0.3% month-over-month and 3.3% year-over-year figures economists anticipated. Much of the weakness in February’s non-farm payrolls additions was contained within select industries. Employment in goods-producing industries dropped by a total of 32,000 positions in February after increasing by 81,000 in January. Within this sector, construction employment fell by 31,000. Manufacturing payrolls increased by 4,000 new positions, below expectations for 12,000. Within service-providing industries, retail trade took the largest hit. Employment in this industry declined by 6,100 in February, after increasing by 13,700 in January. Friday’s jobs report comes following a previous two readings that came in much stronger-than-expected. Ahead of Friday’s results, many economists predicted a moderation in employment growth as December’s blowout results were downwardly revised to 227,000 from 312,000 from the first print, and as colder February weather put a chill on hiring in some sectors. Some analysts cautioned that the weakness in February non-farm payrolls may not carry over after future revisions. But reports from some private agencies have presaged a softening in some parts of the labor market. 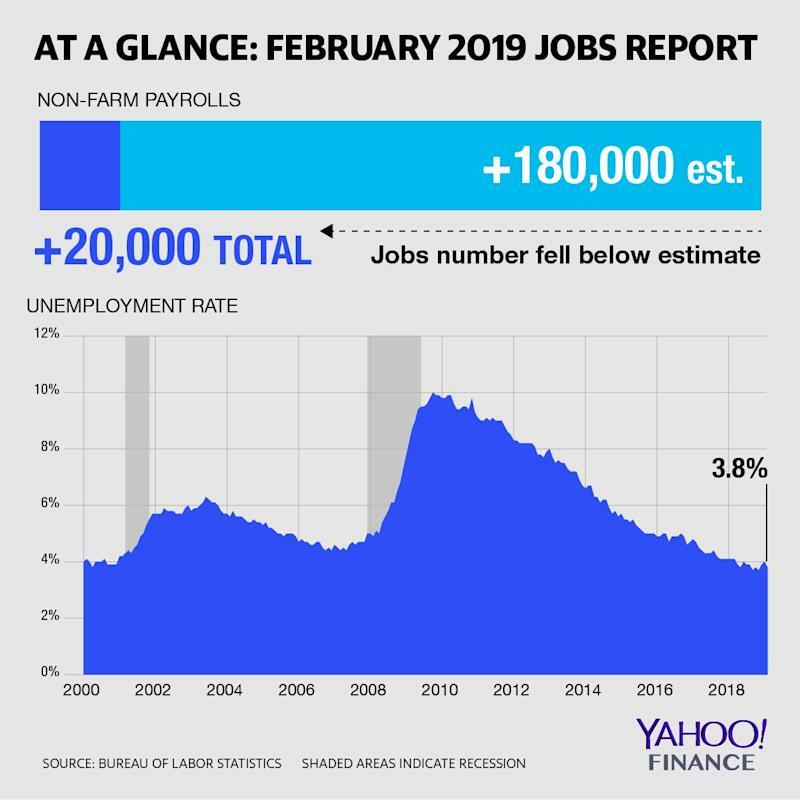 An ADP/Moody’s report Wednesday showed that private sector employment rose by 183,000 positions in February, short of estimates by 7,000 (although the previous month’s reading was upwardly revised). And on Thursday, the firm Challenger, Gray & Christmas reported that U.S. employers announced plans to cut 76,835 payrolls in February, an increase of 117% over last year, with retail leading sectors in job cut announcements.